Apparently, the way to get me to read something is to write a gushing post about it and then specifically name me in the post as someone who should read it. 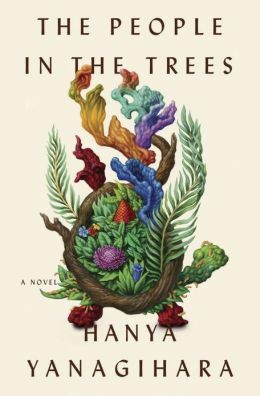 That’s what Other Jenny did in her post about The People in the Trees by Hanya Yanagihara a few weeks ago, and I put it on hold at the library that day. Before Jenny’s post, I hadn’t heard much about this book, beyond the commentary in this year’s Tournament of Books. Even though all the judges admired the book, something about the discussion made me think it wasn’t my kind of thing—that it was trying too hard to be innovative and edgy. (Maybe I was also annoyed that it knocked my beloved Kate Atkinson out of the competition early on.) But Jenny doesn’t go for that sort of thing, so her recommendation made me look again, and I discovered that my impression was indeed a false impression. This novel, Yanagihara’s debut, is slightly off-center in its form (which offers a nod in the direction of Pale Fire), but it’s also a straightforwardly good story. The novel begins with a pair of newspaper clippings in which we learn that a prominent immunologist, Dr. Norton Perina, has been charged and convicted of sexual abuse of one or more of his 43 adopted children. Perina was credited with discovering that a group of Micronesian people, the Opa’ivu’eke of the island of Ivu’ivu, had attained unusually long life through consumption of a particular turtle’s meat. Perina conducted research among these people for years, and many of his children were adopted from the Opa’ivu’eke tribe. Perina’s memoirs, as edited by his research colleague Dr. Ron Kubodera, comprise the rest of the book. Kubodera is a full-on, no-holds-barred Perina partisan, as becomes evident from his effusive preface to the Perina-penned narrative. Kubodera remains a presence in the story through the footnotes, which are sometimes mere citations of sources for additional reading, sometimes additions of background information to help readers understand more about the people of Ivu’ivu, and occasionally commentary on the events Perina describes. Kubodera mostly stays out of Perina’s way, letting him tell his own story in his own way. But his admiration is so over-the-top that he does little to help Perina make his case. Perina doesn’t help his own case much either. This guy is a piece of work, the kind of guy who when mentioning the biographies written about him will note that his favorite is the evenhanded one that treats him as “something close to godlike.” As the story goes on, delving into his work on Ivu’ivu, it’s possible, every once in a while, to forget what kind of person he is, but the megalomaniac always returns, always justifying himself and condemning others. He has a lot to justify, after all. Much of his work does not hold up to modern standards of scientific and anthropological ethics, and much of it was questionable even in the 1950s, when he first learned of the remarkable longevity among the Opa’ivu’eke. His story draws in questions related to how more powerful cultures relate to less powerful ones and what is gained and lost when different cultures meet. But the story doesn’t stop there. The fact that Yanagihara wrote this novel as a fictional memoir, rather than a straight-up novel, adds an additional layer of questions to work through. You see, everything we know about Ivu’ivu comes through Perina, as mediated by Kubodera. Before Perina’s research team went to Ivu’ivu, no one knew anything about the people there. One of the researchers on the team disappeared, and another is treated with scorn by Perina, so we don’t know how well Perina’s impressions jibe with what they saw. We can assume a few things by looking at the footnotes Kubodera provides and seeing what others wrote about them. But it’s interesting to me that a few key moments cannot be corroborated. Those moments are central to the way Perina thinks about the Ivu’ivu and the children he later adopts. I’m not sure how much of the narrative Yanagihara means for us to question, but I question a lot. I’m still working out how I feel about the book’s ending and the way Yanagihara deals with the questions raised in those opening news clippings. I don’t want to say much about this, but up until the last couple of pages, I thought she was making a different choice, and it struck me as a pretty gutsy move, even if it would have infuriated me. But she makes a different choice, and I was initially disappointed. The ending is growing on me as I think about it, even if it’s not quite as bold a stroke as I’d imagined. The book might have felt incomplete with the ending I expected, and this novel feels finished. It’s not tidy, but it’s whole. Okay, I was intrigued by what Jenny said, and now I’m completely sold. I think you’d like this, Jeanne! You have me convinced to read it too! Hooray! I do hope you enjoy it, Laurie! I’m so dumb, I didn’t even think about the fact that a few key moments go uncorroborated by other people who would have witnessed them. That’s really interesting. I’m going to have to reread it with that in mind. And in general: What did you think about the book after he gets back to America? I’ve read a few reviews where people felt the book lost momentum when it started talking about his family. I expected to feel that way and then didn’t at all — I was fascinated and horrified when the memoirs started to talk about how he raised his kids etc. I’m not sure that the lack of corroboration is all that significant, but it caught my attention and made me wonder. I was especially startled by the fact that Norman is the only person who wrote about the sexual initiation ritual, which could in his mind be a key to defending himself. But as I think about it, I’m not sure he cares that much about defending himself. He’s obviously right because he’s the great Norman Perina. As for the ending, I thought she was going to not reveal what actually happened. That would have been gutsy, but frustrating. (And gutsy because it’s frustrating.) But some commenters at the Tournament of Books had some good thoughts about why she structured the ending as she did, with Ron leaving that part out and adding it later, and I liked what that said about the effect Norman has on people. I was pretty sure about what happened, but I had some different ideas about how it might have played out (maybe using the ritual to get the boys under control or something). I liked the part in America. I suppose if the Ivu’ivu people were the most interesting thing about the book, it would have bothered me, but I was fascinated (and repelled) by Norman, so I wanted to see him in another setting. The way he keeps acquiring and then ignoring the kids says a lot about him as a person and his inability to see other people as people. Yes! I thought that too! I sort of wished she’d done that as well — I’d have been less frustrated than impressed, I think. I’ve heard a lot about this book from American friends but it doesn’t seem to have taken off in the UK as yet. However, from everything I have heard it sounds as though it might be just the sort of thing for my most adventurous book group so I think I’ll just add it to the list and then even if I don’t get round to reading it until the very end of the year I’ll know it’s coming up. This would be a great book group book. It would spark a lot of discussion, even among people who don’t like it. I must be living under a rock because I have pretty much missed this one. I am totally intrigued by your write up of it! Jenny’s post and the Tournament of Books are the only places I’ve seen it talked about, so I think it was easy to miss. It deserves more attention than it’s gotten. You’ve added plenty to my pile, so I’m glad to return the, um, favor. I’m not sure I even understand this book but I’m certainly intrigued! I thought the same thing, but it’s pretty easy to follow. I think it’s the kind of book that offers up more if you dig at it more, but is still good (but disturbing) if you just read it for the story.